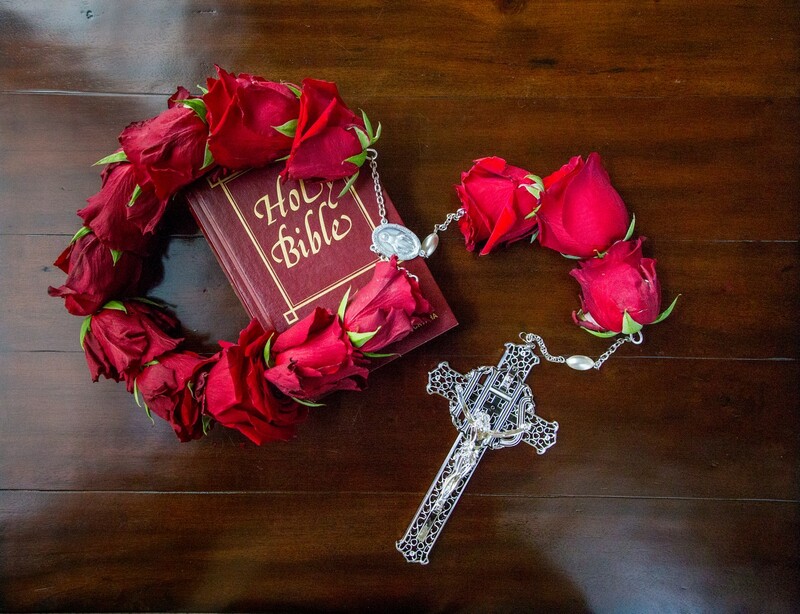 We specialize in beautiful, distinctive Rosaries made entirely of fresh whole roses, carefully and prayerfully created by hand in the USA, and shipped on time to where you want them. The premium rosary for those occasions when only a spiritual splurge will do. To our knowledge, this is the largest fresh flower rosary on the market. With 53 florist-quality roses, it’s an impressive 8-feet in length. Crucifix dimensions: 8.25" x 4.75"
Ship weight and dimensions: 6 lbs., 23" x 20" x 4"
*Product length may vary by a few inches, depending on the size of the roses. 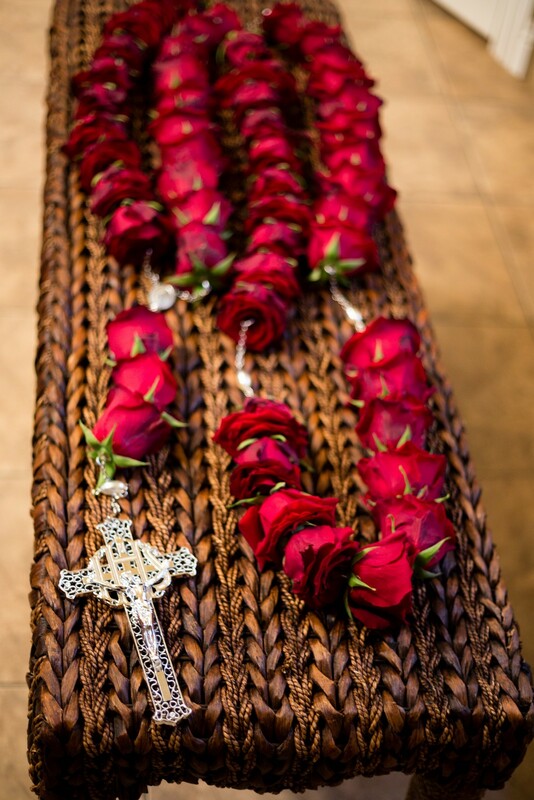 The Chaplet features 33 fresh roses, symbolizing each year of Jesus' earthly life. Impactful, gorgeous, and affordable, this design holds six roses per mystery. At six feet long, it's a delightful "wow" of a rosary. 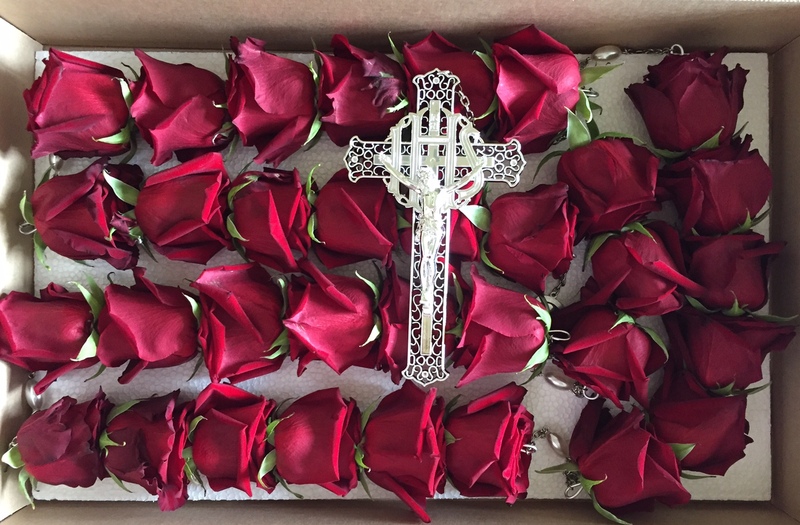 Ship weight and dimensions: 3 lbs., 23" x 14" x 4"
Perfectly proportioned for birthday gifts, sacraments, or to accompany a cremation urn, this style has the same crucifix as our larger rosaries, and one decade of 10 roses, with 3 Hail Mary roses. 40” long. Ship weight and dimensions: 2 lbs., 14" x 11" x 4"
Making a group gift of a Fresh Rosary? Price includes shipping in the lower 48 states. We’ll ask for the name of the recipient, the date of the service, and the name of the giver. You can also include a personal/gift note. If sending to a funeral home, please add the physical address. Do tell us if you have special scheduling requirements. We don’t deliver to PO Boxes. We time your shipment to arrive one business day before the service, so it can cool in the fridge. Our shipping boxes fit into an average household refrigerator. Leave in box and refrigerate upon arrival. Since our specialty is making Fresh Rosaries, and we are not the shipper, we cannot guarantee shipping arrival dates, but we gladly provide tracking information for your Rosary. We have a 100 percent on-time record, and want to please you! This button will open or download a PDF depending upon your settings. It is brief, thorough, and helpful.